• An overload of the clutch is indicated by a longitudinal judder and a blinking display.To exclude a clutch-damage, the clutch is opened and the torque flow interrupted. If the clutch is opened, apply the foot brake and wait some seconds before driving again. • Ignoring the warnings can lead to severe injuries and damage on the car. • If the LCD warning is active, the foot brake has to be applied. • When the clutch is overheated, the safe protection mode operates. According to the safe protection mode, the transaxle indicator blinks with buzzer sound. In this time, the LCD warning about safe protection mode also displays. In this condition, the driving may not be smoothly. If you ignore this warning, the vehicle may not drive smoothly and the system may have problem. For the good condition of vehicle, apply the parking brake and stop the vehicle for few seconds before driving off. • If the vehicle is held by applying accelerator pedal at the hill, the transmission and clutch will be damaged. To hold at the hill, use the parking brake or foot brake. 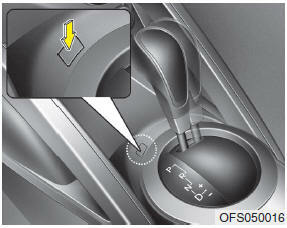 • While shifting the gear automatically, you may feel a corresponding shifting of gear. However, it is not malfunction. • When stopped on an upgrade, do not hold the vehicle with engine power. Use the service brake or the parking brake. • Do not use the P (Park) position in place of the parking brake. Always make sure the shift lever is latched in the P (Park) position and set the parking brake fully. Always ensure vehicle is stationary, at a complete stop, before selecting D (Drive). Ds mode supports the performance mode for driver. To shift the Ds mode, shift the transaxle to Ds mode which is center of sports mode. If you shift [+] or [–] gear, the mode is change to sports mode. The transmission shift is automatically changed at higher engine speeds by engine load, your driving style, vehicle condition. In Ds mode, while coasting downhill, the engine does not support the vehicle to slow down. In Ds mode, if you control the paddle shifter, the gear will be changed to sports mode. If the gear is changed to D (Drive), the gear will be changed to D (Drive) mode. • In sports mode, only the 6 forward gears can be selected. To reverse or park the vehicle, move the shift lever to the R (Reverse) or P (Park) position as required. The paddle shifter can operate when the vehicle speed is more than 10km/h. Pull the [+] or [-] paddle shifter once to shift up or down one gear and the system changes from automatic mode to manual mode.